This substantial lovely Victorian pine door has nine shaped glazing panels, over two horizontal solid panels fitted with decorative mouldings to both faces. 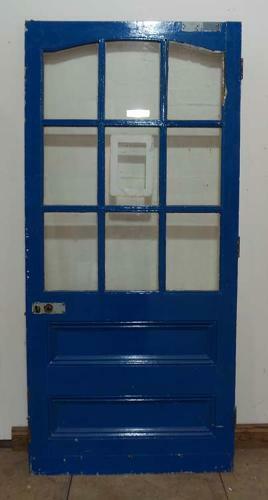 The door is fully morticed and tenoned, and suitable for external use. The door is fitted with aluminium kick plates to the base. The door is in excellent condition, but is currently painted. We are happy to strip it at an additional cost. The door retains glass that may not conform to current safety standards, and may have to be replaced. Please contact us with your requirements.